Across disciplinary borders, clarity is taken for granted as a cardinal virtue of communication in contemporary academia. But what is clarity, how is it practised in writing across disciplinary borders and how does it affect our ways of researching and thinking? This book explores such questions by scrutinizing the ideal of clarity beyond its apparently self-evident value. 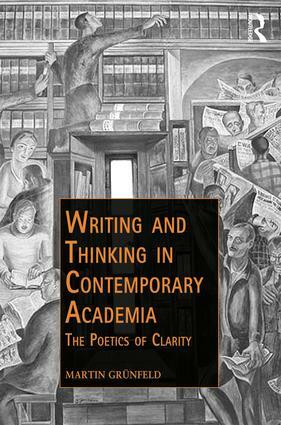 Through a multi-methodological empirical analysis of the ideal of clarity, the author offers a sketch of what is termed ‘the poetics of clarity’, which is unfolded as a field of tension with important implications for sentence formation, authorial positioning and textual organization. By way of a series of reflections on the possible consequences of this for thinking, this volume also explores the parts of knowledge production that may be marginalized, especially poetic language use, biases, interests and contexts, multi-dimensional arguemtents and errors. Revealing a positivist bias and a regime of high-speed consumption that characterize what, in certain regards, might be considered a productive space for knowledge production, Writing and Thinking in Contemporary Academia will appeal to scholars with interests in the sociology of knowledge, continental philosophy, the philosophy of science and academic writing. 10. Clarity – A Potential Acceleration of Thinking? Martin Grünfeld is Assistant Professor in Science Communication at Medical Museion and the Novo Nordisk Foundation Center for Basic Metabolic Research at the University of Copenhagen, Denmark.